The thought here is that after next month’s rate hike, investors see fewer than the three hikes that were priced in only months ago for 2019, and thus lower rates make stocks more attractive. But in an interview on CNBC yesterday with Gluskin Sheff’s David Rosenberg, he made the point that one less quarter-point rate hike next year does not change the fact that that the Fed’s balance sheet reduction aka quantitative tightening has effectively made financial conditions far tighter than what the Fed Funds rate suggests. Rosenberg suggests that the Fed allowing $600 billion in bonds this year and next is the equivalent of over 100 basis points of tightening this year and next. It’s been my view that for the Fed to back off of increases before the Fed Funds rate was at least above the inflation rate that it would likely signal a downgrade of the U.S. economy, that is in the 10th year of the longest economic expansion in 100 years. Its also been my view that the relative underperformance of banks stocks in 2018 has been signaling that an economic recession is likely to come sooner than most economists think, as investors should be piling into this group given the promise of the fiscal stimulus of last year’s tax cuts and a tight labor market. But this has not been the case, aside from JPM’s 3% year to date gains, basically, in line with the S&P 500’s ytd performance, many in the group are in severe correction territory. Looking at U.S. bank stocks its a classic case of the good, the bad, and the ugly. As we head into next month’s Fed meeting, and ultimately year-end I see little reason why investors will look to bottom fish in the poor performing names in the group, despite cheap valuations. I also think that after Wednesday’s gains, the Fed statement could offer more color on QT as Rosenberg highlighted in the interview from yesterday, and this might cause a slight reversal of the near term positive sentiment stoked by Powell’s change of verbiage. It is my opinion that the poor performance of most bank stocks all-year signals a less rosy outlook for the U.S. and the global economy in 2019 and it makes sense to at least lighten up on bank stocks and traders consider defined risk shorts. 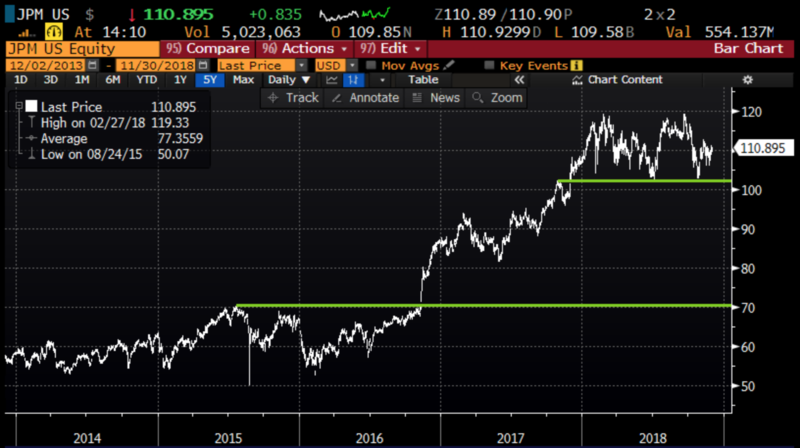 Citi (C) stands out to me as a stock that could be vulnerable into the new year. 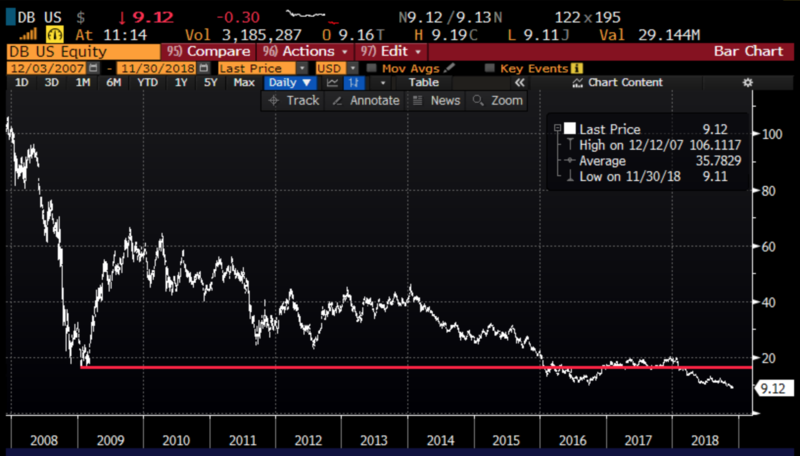 On valuation it is the only major U.S. money center bank that trades below its book value, I suspect that is for good reason. Secondly, the stock’s recent bounce from just above $60 comes above massive technical support. 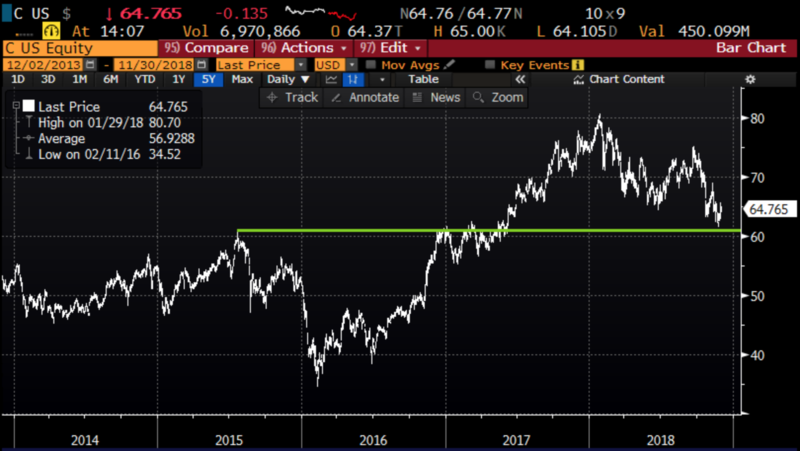 And lastly, if DB were to cause a sort of contagion in the Euro banking sector, or if the trade war with China and possibly Europe were to cause a global growth scare, Citi’s exposure outside the U.S. would quickly be viewed as a liability. 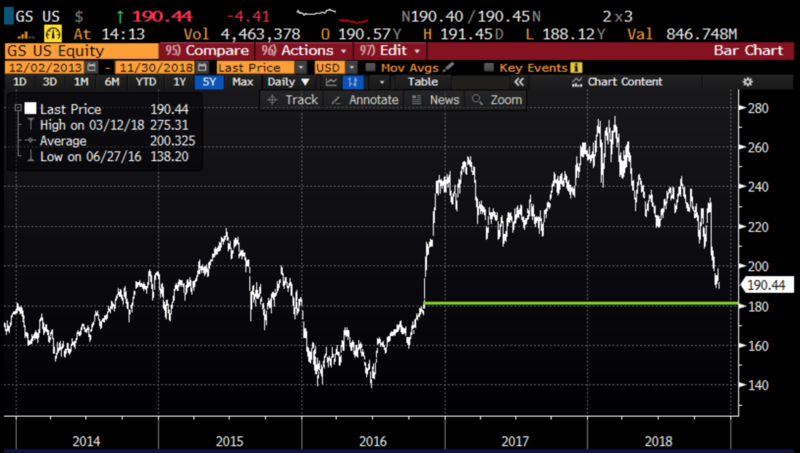 The next identifiable catalyst for Citi will be their Q4 results on January 14th, but I suspect near term any further escalation of the trade dispute, further collapse of DB and a reversal of this weeks enthusiasm of Fed commentary and banks stocks close on lows for 2018. Rationale: This trade idea risks 1.5% of the stock price over the next three weeks, but given the markets recent volatility, the group’s underperformance, and no shortage of potential tape-bombs risking 1 to possibly make 3 if the stock is back at support looks attractive imo. Given the short-dated nature of this trade idea, it makes sense to consider a downside stop. As regular readers know we like to use a 50% premium stop on long premium event trade ideas.